Cleans all types of motorcycle (road and off-road), quad and kart chains. Removes all encrusted deposits: sand, earth, oil, grease ... Chlorine-free formula. MOTUL Chain Clean cleans all types of motorcycle chains (road and off-road) and those of other vehicles (bicycle, mopped, go kart, ATV...). 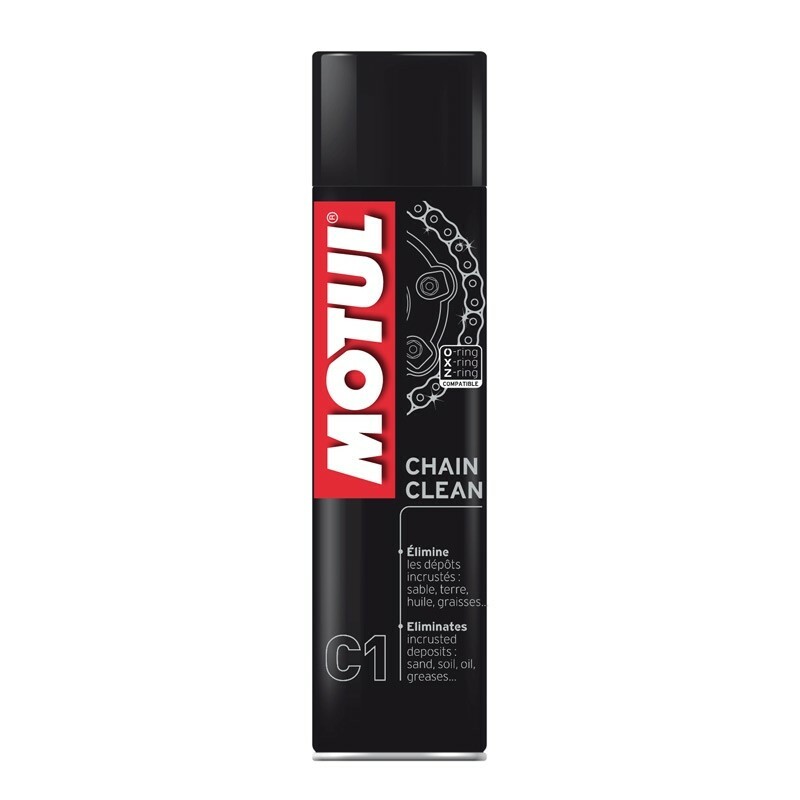 MOTUL Chain Clean cleans all types of motorcycle chains (road and off-road) and those of other vehicles. Its chlorine-free extreme grease removal formula is perfectly suited to O-ring, X-ring, Z-ring chains. 1/ Spray on chain and let dry for 5 minutes. 2/ If the chain is very dirty, brush with a non abrasive brush an spray again. 3/ Lubricate the chain with MOTUL Chain Lube Road (for road bikes) or MOTUL Chain Lube Off Road (for off road bikes) or MOTUL Chain Paste or MOTUL Chain Lube Factory Line (for racing bikes). To increase the lifespan of the chain, repeat every 1000 km.